The wood has a golden base and is divided horizontally into two parts, according to a thirteenth century tradition. The upper part features a portrayal of the Madonna with an infant in her arms, posed according to the Byzantine model of the Pelagonitissa, while two angels hold rich drapery around her shoulders. In the lower part, there are portraits of five saints. At two extremes are St. Francis and St. Clare, who are depicted slightly in profile compared to the frontal poses of the central figures, where St. Michael the Archangel, St. Augustine, and St. Catherine of Alexandria can be recognised. Recognised by critics as the work of Giovanni da Rimini, in 1924 by Raimond Van Marle and in 1937 by Roberto Longhi, it was considered one of the earliest famous works by Giovanni da Rimini. 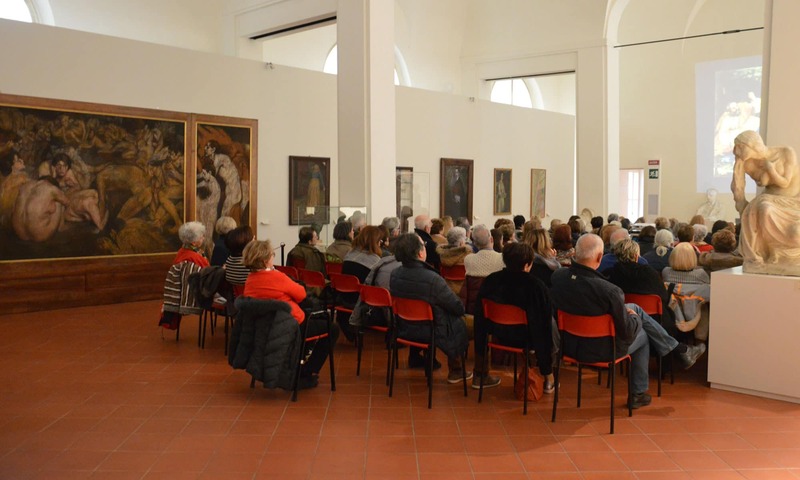 According to this appraisal, which was created during the fervent years around 1300, it would be one of the oldest demonstrations of artists in Rimini reacting immediately to the work of Giotto in the city.